Anna has studied at the University of Liverpool (BA) and the University of Cambridge (MPhil). She is now a second year doctoral candidate in English Literature at the Centre for Eighteenth Century Studies, University of York. Anna’s research focuses on the collaborative literary relationship that existed between Percy Bysshe Shelley and Mary Wollstonecraft Shelley from their initial meeting in 1814 through to Percy Shelley’s death in 1822, as well as considering Mary Shelley’s later work. Her thesis aims to identify the textual connections between the works of the two authors, considering the Shelleys’ relationship in terms of literary and stylistic ideas, as opposed to purely biographical studies. She is also interested in literary relationships in the Romantic period more generally, and has published an essay on the poetical dialogue of S. T. Coleridge and Sara Coleridge. Anna is on Twitter. Shelley’s interest in Emilia slowly waned over the course of 1821 and dissipated by the time of her marriage to an Italian nobleman in September of that year. But the interlude widened the developing rift between Shelley and Mary, and made her more cautious in both her emotional and her intellectual engagement with him. 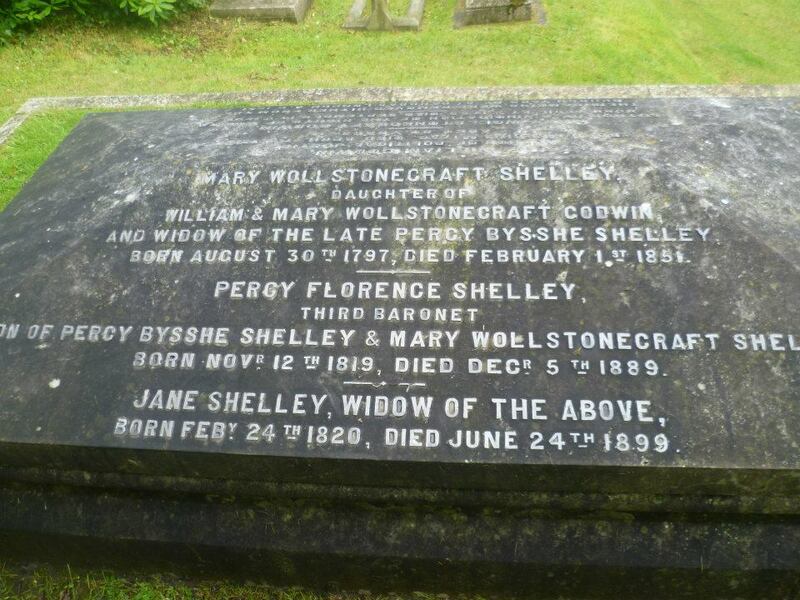 However, despite this suggesting that the creative process of composition becomes something Percy hides from Mary, I want to suggest that the shift in collaboration is not so black-and-white as to reduce the Shelleys’ relationship to one simply of alienation in the later years of their marriage. One step towards doing this is to consider the Shelleys’ extant letters to each other in these later years. This blog focuses in particular on the letters of 1821 in order to support my suggestion. 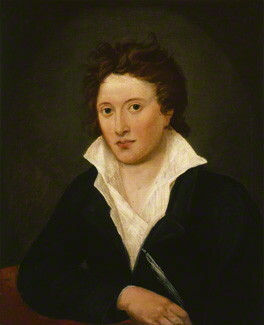 Percy Bysshe Shelley by Amelia Curran, 1819. National Portrait Gallery. My dearest love – […] I spent three hours this morning principally in the contemplation of the Niobe, & of a favourite Apollo; all worldly thoughts & cares seem to vanish from before the sublime emotions such spectacles create: and I am deeply impressed with the great difference of happiness enjoyed by those who live at a distance from these incarnations of all that the finest minds have conceived of beauty, & those who can resort to their company at pleasure. What should we think if we were forbidden to read the great writers who have left us their works. – And yet, to be forbidden to live at Florence or Rome is an evil of the same kind & scarcely of less magnitude. […] Kiss little Babe, and how is he – but I hope to see him fast asleep to-morrow night. – And pray dearest Mary, have some of your Novel prepared for me for my return. How is my little darling? And how are you, & how do you get on with your book. Be severe in your corrections, & expect severity from me, your sincere admirer. – I flatter myself you have composed something unequalled in its kind, & that not content with the honours of your birth & your hereditary aristocracy, you will add still higher renown to your name. Percy is at once concerned with his wife’s progress in writing: ‘expect severity from me’ implies Percy will be critiquing the work. Yet he is also her ‘sincere admirer’ and sees her future legacy as something dependent on her own genius and not just because of her famous literary parents, William Godwin and Mary Wollstonecraft. 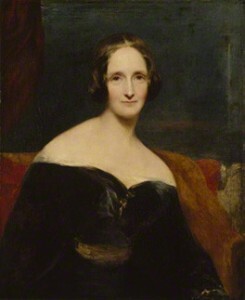 Mary Shelley by Richard Rothwell, exhibited 1840. National Portrait Gallery. Shocked beyond all measure […] I wrote to you with far different feelings last night – beloved friend – our bark is indeed tempest tost but love me as you have ever done & God preserve my child to me and our enemies shall not be too much for us. we will defy our enemies & our friends (for aught I see they are all as bad as one another) and we will not part again. This shows a united front and a defiance that prevails in the Shelleys’ relationship: Mary sees ‘enemies’ as something to be challenged by the Shelleys as a couple, in both 1814 and 1821. 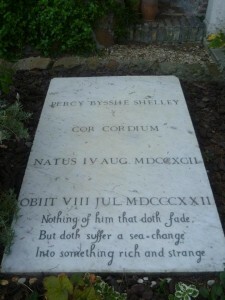 The Grave of Percy Bysshe Shelley, Non-Catholic Cemetery, Rome. However, there is evidence elsewhere that intellectual discussions remained a primary concern for Mary in 1821. Mary Shelley writes to Maria Gisborne in November: ‘Do you hear anything of Shelley’s Hellas?’ Hellas was completed by Percy in late October, and is one of the few works of Percy Shelley’s to be published in his lifetime (it was published in February 1822). Although, like Epipsychidion, the manuscript fair copy of Hellas wasn’t sent to the publishers in Mary’s hand, the inclusion of Mary’s queries on the work in this letter show her awareness and possible involvement in the toil required in order to bring this poem to press. In this letter to Maria Gisborne from 1821 Mary also writes: ‘Ollier [the Shelleys’ publisher in England] treats us abominably – I should much like to know when he intends to answer S-’s last letter concerning my affair. I had wished it to come out by Christmas – now there is no hope.’ The Shelleys’ literary affairs – in Italy where composition occurs, and back in London where they attempt to publish – are as entangled as ever. My greatest content would be utterly to desert all human society. I would retire with you & our child to a solitary island in the sea, would build a boat, & shut upon my retreat the floodgates of the world. – I would read no reviews & talk with no authors. – If I dared trust my imagination, it would tell me that there were two or three chosen companions beside yourself whom I should desire. – But to this I would not listen. – Where two or three are gathered together the devil is among them, and good far more than evil impulses – love far more than hatred – has been to me, except as you have been it’s object, the source of all sorts of mischief. So on this plan I would be alone & would devote either to oblivion or to future generations the overflowings of a mind which, timely withdrawn from the contagion, should be kept fit for no baser object. 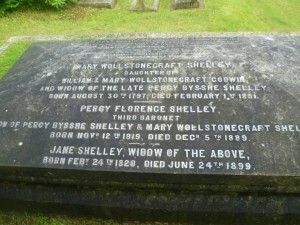 The Grave of Mary Shelley, The Parish Church of St Peter, Bournemouth. Here Percy equates being alone with being with Mary, and the safety and comfort this brings. Mary’s letter to Maria continues: ‘We live in our usual retired way, with few friends, and no acquaintances’. This intimate circle now referred to as ‘Shelley and his circle’ and eulogized by Mary in 1824 as she remembered ‘with fondness […] having made a part of the Elect’, had Percy and Mary Shelley at its core, and a literary and intellectual bond was constant between them. The nuances of level of emotional connection and collaboration on written work may be altered from 1814 and the Frankenstein years, but this is to be expected. Overall, the enduring closeness of the Shelleys (especially concerning intellectual matters) prevails in 1821, and the letters are evidence of this. Such observations have typically been eschewed to make the Shelleys’ story a more straightforward one in which intimacy becomes estrangement: but they were not straightforward people. My next task is to see if the creative works (such as Valperga) evidence this further. P B Shelley, The Letters of Percy Bysshe Shelley Vol. II ed. by Frederick L. Jones (Oxford: Oxford University Press, 1964) 18 June 1822, p. 434. Newman Ivey White, Shelley Vol II (London: Secker and Warlburg, 1947), p. 255. Daisy Hay, Young Romantics (London: Bloomsbury, 2010), p. 206. P B Shelley, Letters Vol II 10th August 1821, p. 324. Mary W Shelley, The Letters of Mary Wollstonecraft Shelley (3 vols) Vol I ed. by Betty T. Bennett (London: The Johns Hopkins University Press, 1980 repr. 1991), pp. 186-187. Mary W Shelley, Letters Vol I, p. 204. Mary W Shelley, Letters Vol I, p. 5. It was in the hand of Edward Williams. Mary W Shelley, Letters Vol I, p. 209. P B Shelley, Letters Vol II 15 August 1821, p. 339. Mary W Shelley, Letters Vol I, p. 210. Mary W Shelley, Letters Vol I, p. 450.